Currently, very little is known concerning the correlation between nanoparticles and their physiological effects. This issue is exceedingly complex as the particle composition, size, shape, and surface structure are likely to work in concert to control their overall effects. In this project, students will synthesize and characterize a diverse set of nanoparticles in the Knecht group, followed by quantification of their physiological effect on C. elegans worms in the Collins group. For this, a diverse particle palette will be prepared including metallic, metal oxides, and metal sulfides due to their broad range of applications (catalysis, energy, theranostics, etc.). The particles will be prepared via standard syntheses where their size can be varied from 1-100 nm. Known synthetic pathways can access nanoparticle shape control, and a variety of surface passivants (alkane thiols, surfactants, and polymers) will be examined to determine interfacial effects. Once the particles are characterized (UV-vis, TEM, SEM, etc. ), we will test how exogenous treatment affects C. elegans viability and behavior in the Collins group. We hypothesize that smaller, hydrophilic nanoparticles are more readily internalized during feeding, leading to substantial changes in worm longevity and brood size. We anticipate that treated animals will die sooner and have fewer progeny and that this will correlate with specific nanoparticle features. To understand the mechanism of toxicity, we will use light microscopy to record rates of pharyngeal pumping and defecation in treated and untreated animals. This will test our hypothesis that particles of a certain size and shape mechanically clog the grinder in the C. elegans pharynx, disrupting feeding and defecation behaviors. To test whether the particles affect worm sensory responses, we will separately measure chemotaxis behavior to bacterial food or diacetyl in treated and untreated animals. It is envisioned that animals will be less able to detect and navigate toward attractive chemical cues. These results will help to understand how specific, chemically-defined materials affect animal physiology and behavior. The goal of this project is the development of viable strategies to label Drosophila melanogaster embryos with fluorescent probes during cellularization to monitor cells and tissues through subsequent stages of embryogenesis in real time. Students will prepare supramolecular nanocarriers with fluorescent cargo as well as characterize their structural and photophysical properties in Raymo's labs. They will then inject the resulting constructs in live embryos and image the specimens over time in Baker's labs. 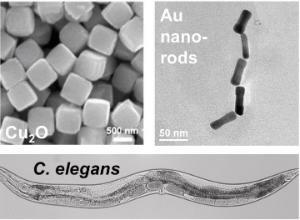 The nanocarriers will be assembled from amphiphilic polymers and borondipyrromethene dyes routinely synthesized by Raymo. These polymers incorporate multiple hydrophobic and hydrophilic chains along a common macromolecular backbone and spontaneously assemble into nanoscale particles in water. In the self-assembling process, the particles capture hydrophobic fluorophores in their interior to generate biocompatible constructs with optimal photophysical properties for bioimaging. 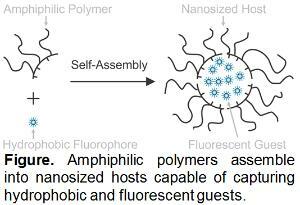 Students will prepare a series of nanocarriers, differing in the structural composition of their amphiphilic and/or fluorescent building blocks, as well as in the number of molecular guests per supramolecular host. They will characterize the physical dimensions of the resulting assemblies with a combination of dynamic and static light scattering measurements. Additionally, they will rely on absorption and emission spectroscopies to determine the critical polymer concentration required for nanocarrier assembly and quantify the molar absorption coefficients, brightness, and fluorescence quantum yields of the probes. The particles with the most appropriate structural and photophysical properties will be microinjected in embryos during cellularization in the Baker lab. The sequential acquisition of fluorescence images with a confocal microscope over the course of embryogenesis will reveal initial spatial localization of the fluorescent probes and their gradual redistribution within the developing organism in real time. These analyses will indicate if the presence of the nanoparticles in the embryos has any influence on development. These studies will contribute viable analytical tools to investigate cellular dynamics in live embryos and provide valuable insights on the fundamental processes responsible for embryogenesis. Small carbon nanoparticles with sizes < 10 nm are usually fluorescent. The up- and down-conversion photoluminescent (PL) properties of these nanoparticles are similar to those of conventional semiconductor quantum dots (QDs). However, their excellent biocompatibility and low cytotoxicity makes carbon nanoparticles superior to QDs particularly for bioimaging applications. Currently, very little is known regarding the mechanism and process of tissue imaging with carbon nanoparticles. In this project, students will first learn how to synthesize and characterize carbon nanoparticles in Leblanc’s group. Various methods will be used to prepare these nanoparticles, such as hydrothermal synthesis, bottom-up, and top-down approaches. The prepared products will be characterized by UV-vis, fluorescence, and Fourier transform infrared spectroscopies, as well as atomic force and transmission electron microscopy, to confirm the chemical structureand morphology. After synthesis and characterization, the students will move to the bioimaging studies of these nanoparticles in chicken embryo models in Skromne’s group. The advantages of using a chicken embryo model include low cost, easy manipulation, and physiological homology to humans. Students will learn how to inject nanoparticles into chicken embryos, how to operate optical microscopes, how to track carbon nanoparticles in live and fixed specimens, and how to interpret data. Students will also have the opportunity to treat chicken embryos with pharmacological agents to alter their development and study the effect of the manipulation of carbon nanoparticle bioaccumulation. Biological cells employ a variety of signaling mechanisms to control intracellular events that involve chemical signaling molecules (the primary messenger ligand) and cell receptors. Interactions between these ligands and receptors result in an intracellular message that is picked up by second messenger molecules. Calmodulin is one such second messenger that interacts with several intracellular proteins through its helical arm region and activates signaling pathways in a calcium-dependent manner. It has been found that certain small molecules such as phenothiazines can compete with such downstream signaling by binding to the same binding site of calmodulin. In this research, the REU student will immobilize different phenothiazine derivatives onto microelectrodes by chemically coupling them to the electrode through a spacer arm containing a functional group (e.g., 10H-(phenothiazine-10)hexanethiol). 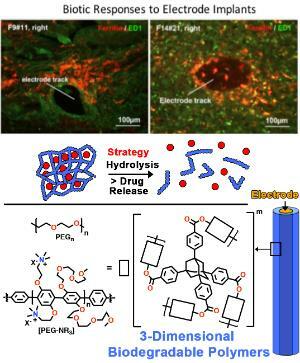 The student will study the electrochemistry of the immobilized phenothiazines and evaluate whether the affinity of phenothiazine to calmodulin could be altered through electrochemical means. We hypothesize that oxidation of the electrochemically active phenothiazines reverses binding to calmodulin, which leads to activation of cellular signaling pathways. The student will benefit from the ongoing collaboration between the research groups of Bachas (electrochemistry) and Daunert (calmodulin signaling in cells). It is envisioned that this research will lead to a new approach of inducing cell signaling events and understanding intracellular processes. RNA aptamers are small oligonucleotides selected in vitro to bind target molecules with high affinity and specificity due to their stable three-dimensional conformations. Aptamers can be selected to bind to membrane receptors or ligands overexpressed in cancer cells. Therefore, aptamers conjugated to nanoparticles with high loading capacity for cytotoxic agents are promising as targeted drug vehicles or nanocarriers for chemotherapy. The Serafini group has isolated aptamers that specifically bind to tumor educated myeloid cells (TEMCs), which play important roles in breast cancer invasion and metastases. As drug carriers, we are interested in polymeric nanoparticles, such as those based on poly-lactic-co-glycolic acid (PLGA). Therefore, our research plan is to work on the preparation of bioconjugates that combine the TEMC-targeting ability of the aptamers with the drug carrying ability of the PLGA nanoparticles. 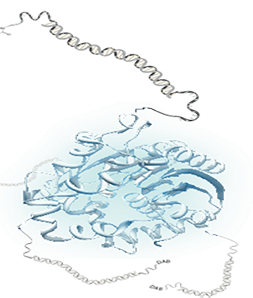 Polyethylene-glycol (PEG) chains are the ideal choice to serve as connectors between the PLGA and the aptamer components. Therefore, we will start the project by having undergraduate researchers investigate the conjugation of PLGA nanoparticles with PEG chains. Carboxylic acid-terminated PLGA chains (PLGA-COOH) will be converted to the corresponding succinimide using 1-ethyl-3-[3-dimethylamonopropyl] carbodiimide hydrochloride (EDC) and N-hydroxysuccinimide (NHS). PLGA-succinimide will react with NH2-PEG-COOH oligomers to yield PLGA-CONH-PEG-COOH polymers. The terminal carboxylic acid can be reacted using similar procedures with 5’-amino terminated capture oligonucleotides that can be used to connect the TEMC aptamer. The modularity of this synthetic approach provides considerable flexibility. However, EDC/NHS amide coupling reactions are notoriously variable in efficiency, so these experiments are extremely important to devise the best synthetic pathways to the final nanoparticle assemblies. The students will also work on the characterization of the reaction products using mass spectrometry (MALDI or ESI), dynamic laser scattering, and related techniques. Fluorophore tags are widely employed as imaging agents in microscopy; however, the need to fix, permeabilize, and repeatedly rinse samples precludes imaging the dynamics of an intracellular target in living cells and tissues. Research in J. Wilson’s group focuses on development of membrane-permeable, biomimetic probes that both exhibit "turn-on" emission upon binding their target and are compatible with life. 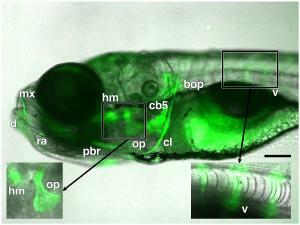 In this multidisciplinary project, two students will first investigate the optical properties of various fluorescent turn-on markers that target DNA/RNA, kinases and transporters, and second, using zebrafish and pea aphids, determine live cell compatibility, toxicity, and biodistribution of these turn-on dyes. Selected dyes currently available in J. Wilson’s group will be characterized physically (log P, pKa, solubility) and photophysically (max, abs, , max, em, em) by the REU students. 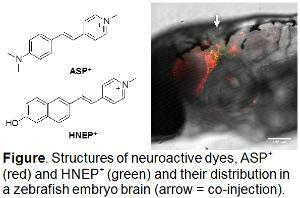 One student will transition to the Dallman lab and will inject dyes into zebrafish embryos. Because zebrafish are optically transparent, injected dyes are readily visible enabling students to determine the tissue specificity and subcellular localization of the dyes. By injecting dyes into stable transgenic animals with fluorescent proteins marking organelles, students will quantify the colocalization of fluorescent fish proteins and turn-on fluorophores using the Core Confocal Facility. A second student, working in A. Wilson’s lab, will feed dyes to female 4th instar pea aphids in an artificial diet. Students will investigate the live cell compatibility and toxicity of the fluorophores. Live cell compatibility will be investigated in aphid embryos two days after maternal feeding, when they will be dissected from mothers and visualized using whole mount confocal microscopy. Toxicity will be studied through life-table experiments that quantify aphid fecundity, longevity, and mass. At the completion of this project, students will have acquired a broad skillset and understanding of the photophysical properties of dyes and, by working with biological models, will have developed an understanding of animal anatomy and cell biology with respect to fluorophore labeling. Small molecule metabolites, cofactors, and ligands interact with proteins and play critical roles in cell function, but because of their intrinsic size, cannot be easily labeled or detected through traditional spectroscopic methods. For example, Apo binding proteins contain riboflavin-based redox active cofactors that undergo ultrafast photoinduced electron transfer in the protein pocket, resulting in a fluorescence quenching of the signal. The binding and transport of small molecules to their target site is particularly interesting for drug delivery and biosensing, but designing such systems with self-reporting capabilities is challenging. This project addresses this challenge in a collaborative effort between the Deo and Scott research laboratories - to design and incorporate non-natural amino acids into target proteins (Deo) and study their binding motifs with ligands and small molecules through experimental physical chemistry methods (Scott). The binding proteins that we propose to employ, as the recognition elements are proteins that undergo a conformational change upon ligand binding, specifically using intrinsically unstructured proteins (Deo). We will employ the in vivo method developed by Schultz and colleagues that allows for incorporation of over 30 non-natural amino acids into virtually any chosen protein at specific locations, with the ability to scale-up the production of these ‘non-natural’ proteins. REU researchers will study the physical properties of redox and optically active non-natural amino acids using steady-state optical spectroscopic studies (Scott). We will utilize temperature dependent UV-vis and fluorescence to study the binding interaction of intrinsically unstructured proteins as a function of temperature and concentration. These studies are important for the ultrafast time-resolved transient absorption techniques to probe photoredox reactions, which are relevant for tracking reactivity in the absence of fluorescence. Polychlorinated biphenyls (PCBs) are persistent organic pollutants that have adverse biological effects. The mitigation of such toxicants is necessary; however, technologies to achieve this are substantially limited. It also remains unclear how the degradation of PCBs affects their toxicity as a function of reaction progression, a critically important factor in designing environmental cleanup protocols. In general, reductive dehalogenation with in situ H2 generation is preferred over oxidative processes as the ultimate product is non-toxic. Current catalysts to achieve these capabilities are degraded during H2 generation; thus, they are deactivated and cannot be used for long-term remediation. Alternatively, photocatalysis is a sustainable approach for H2 production via water splitting, using photons (i.e., sunlight), water, and earth abundant materials. In this project, the REU participant will use Cu2O-based photocatalysts with surface deposited Pd nanoparticles as a material for PCB degradation using light in the Knecht and Bachas groups. 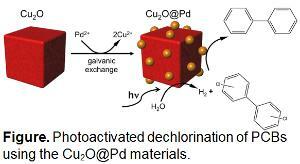 In this arrangement, the metal oxides will generate H2 through photocatalytic water splitting, where this H2 can be used to drive PCB dechlorination at the Pd domains. The students will monitor reaction progression as a function of time to determine any intermediates formed. From this information, they will identify changes in sample toxicity as a function of reaction progression in the Toborek group using a range of biological cell cultures. Our ongoing collaboration utilizes fluorescent kinase inhibitors to assay receptor tyrosine kinase populations in EGFR/ERBB-overexpressing cells. This project is truly multidisciplinary, with activities ranging from organic synthesis of novel inhibitors, to biochemical evaluation of their binding in vitro and in situ, to photophysical characterization and fluorescence microscopy. 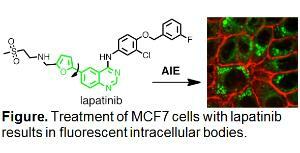 The work proposed for the undergraduate student is an independent line of investigation that stems from an intriguing observation: Lapatinib, a kinase inhibitor, accumulates intracellularly as fluorescent aggregates or vesicles. The composition of these bodies is not known (i.e. are they aggregates or bound to their putative target, another protein, or deposited in defined compartments?) and is key to understanding their role in inhibition of the EGFR/ERBB pathway. We propose to isolate these bodies and determine 1) what cellular components are associated with them and 2) has the inhibitor been chemically modified/metabolized. Lysate from lapatinib-treated cells will be separated by gradient ultracentrifugation. The fluorescent bodies can be identified under a UV lamp and will be separated for (bio)chemical characterization. Organic-soluble extracts will be characterized by HPLC, HRMS, 1H-NMR, UV-vis, and fluorescence spectroscopy. The water-soluble fractions will be characterized with respect to their chemical, optical, and inhibitory properties. To this end, preparative recovery from biological material will be complemented by studies of cellular properties. At the completion of this project, students will have acquired a broad skillset and understanding of the basic properties of compounds that relate to their efficacy and pharmacokinetics as well as its relationship to molecular and cellular biology. Penetrating microelectrodes arrays (MEAs) have become the cornerstone of neuroprosthetic devices that rely on recordings from large populations of neurons to restore movement and control after injury or damage caused to the nervous system. While high-density MEAs have been developed to access large neuronal ensembles, the inability of current systems to reliably access these signals for long periods of time (tens of years) has become a challenge in the development of reliable neural interfaces limiting the translation of technology from a research setting to activities of daily living. To circumvent this limitation, our team will engineer electrode sensors consisting of smart (active) coatings to enable the slow release of anti-inflammatory drugs while monitoring neuronal activity. Leveraging on hydrolysis of ester functions and cleavable peptide fragments, slow dismantlement of hydrophilic 3-dimensional networks (hydrogels) anchored on electrode arrays will enable encapsulated anti-inflammatory factors to diffuse and stop scar formation. Student involved in this project will synthesize and characterize biodegradable 3-dimensional polymers to be anchored on electrodes. We will then investigate the in vitro degradation of this material and quantify the release of drugs using HPLC and spectroscopy techniques. In addition, the student will learn a combination of organic chemistry, materials science, and microscopy techniques.